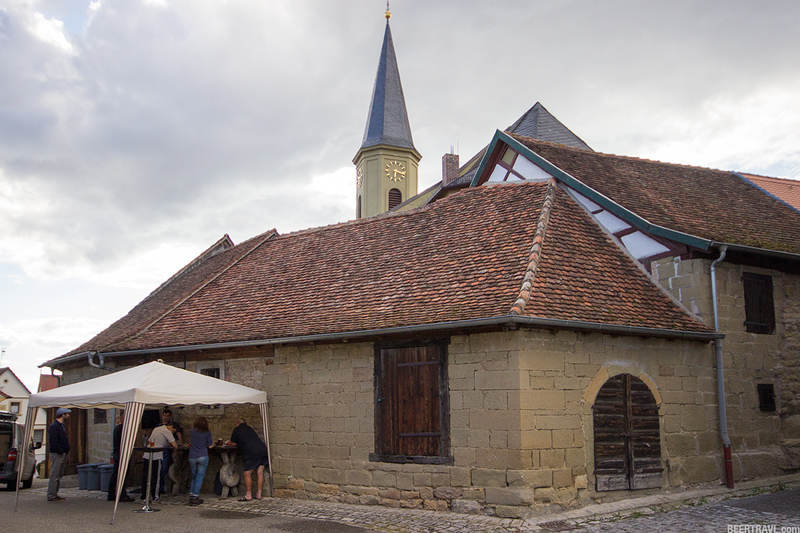 Seinsheim, Lower Franconia, population 1000, home of what may be the smallest brewery in Franconia. 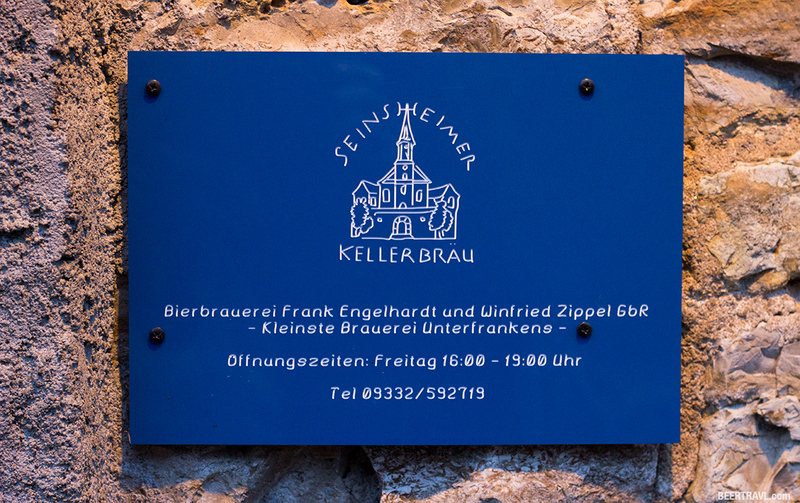 Seinsheimer Kellerbräu is housed in the side of the town church, where self-taught Frank Engelhardt and family open the doors every Friday while they brew. 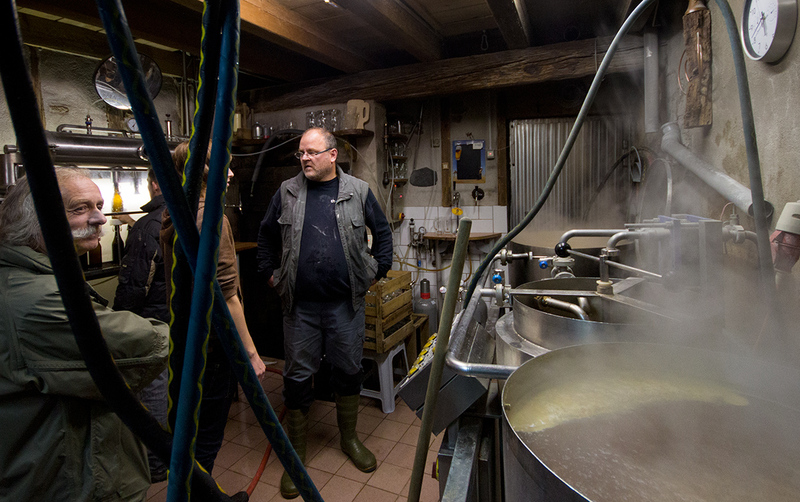 Frank attends to the boil over the course of a Friday afternoon, some days he tends to the operation himself if they are only making beer, serving mugs to the locals and travelers who manage to stop in. But some days they also bottle one batch as they boil the next, and the scene is hectic and humid and wet. Their Danzbier Hell and Dunkles Kellerbier are malty, rich, rustic treasures of Lower Franconia. 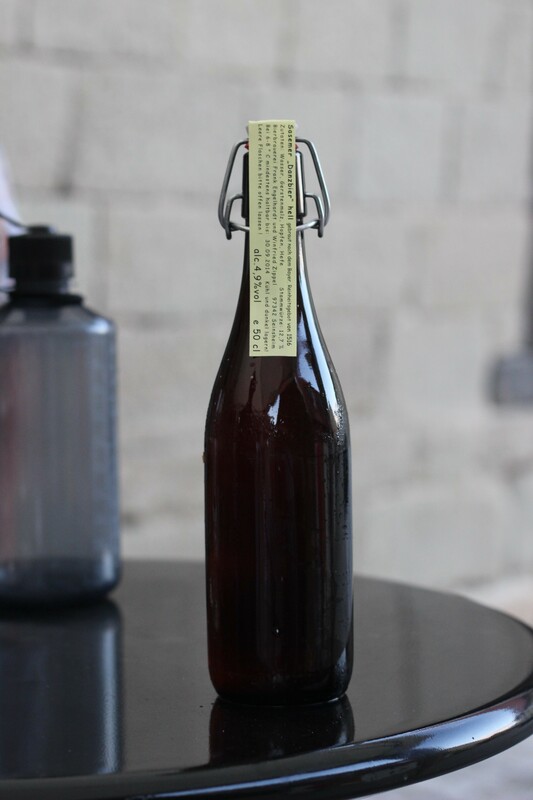 Highly caramelized from a long boil, a character found in some Zoiglbier (which are worthy of comparison here), and lagered for 5 to 6 weeks before being tapped directly from the conditioning tanks. 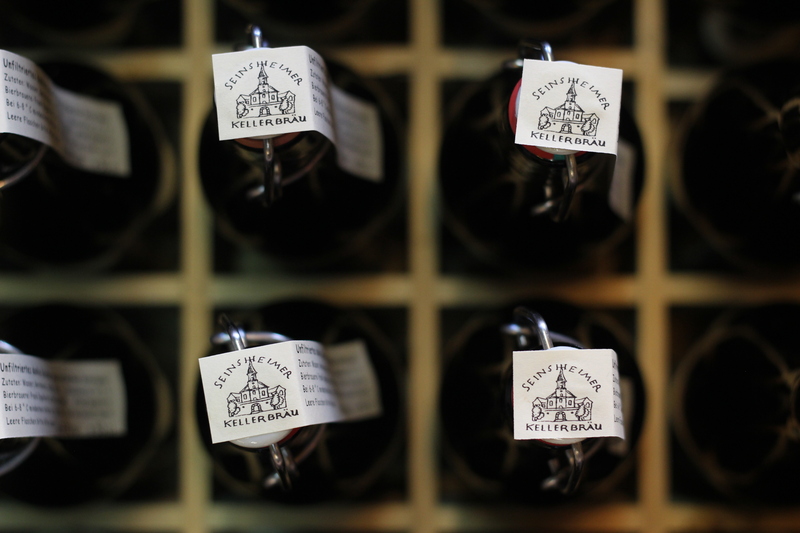 They sell cases reserved in advance, hand-bottled swing-tops, but the experience of the beer in the bottle does not compare to a draft pour that has not touched oxygen. 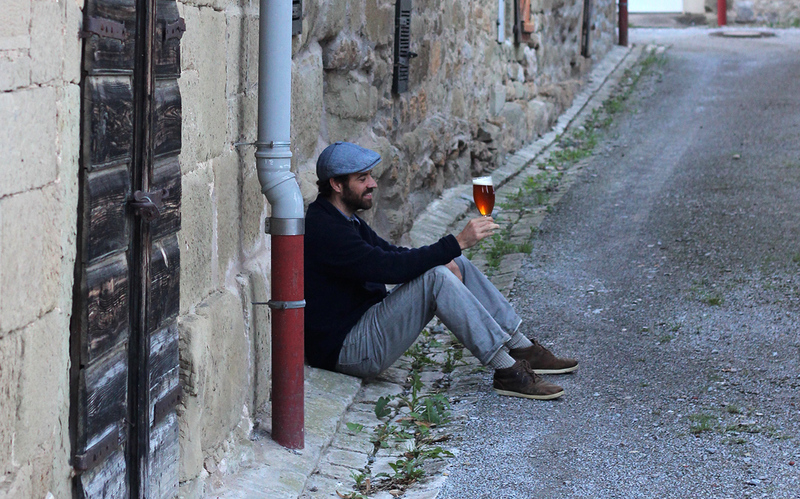 These two lagers (or a Bockbier in the winter if you’re lucky) are well worth the hour-long drive from Bamberg, and a stay overnight is available at Seinsheim’s only hotel. From draft at Seinsheimer Kellerbräu. Hazed amber-orange with a creamy and billowy white head. A restrained touch of smoked malt plays with honey melanoidins, mineral-heavy water, nutty pastry breads and toasted sunflower seeds... an old world bakery in liquid form... distant campfire being smelled through a humid forest.... The aroma comparable to Gänstaller Bräu Golden Smoked Zoigl (a 5.0 for me) - not something that I ever expected to find again. It’s less hoppy and bitter than Golden Smoked Zoigl, the hops imparting subtle pepper-citrus notes, but make no mistake, this is a malt experience all the way. Highly caramelized, the richness in the mouth is jaw-dropping... honey malt and minerals the finish see no end... the mouth feel is lush, creamy, unbelievably soft, again, Gänstaller-level. This is an absolute stunner, would not be out of place in an Oberpfalz Zoiglstube. The husband and wife team brewing in small kettles are creating magic that is rare to find in this crowded world of beer. 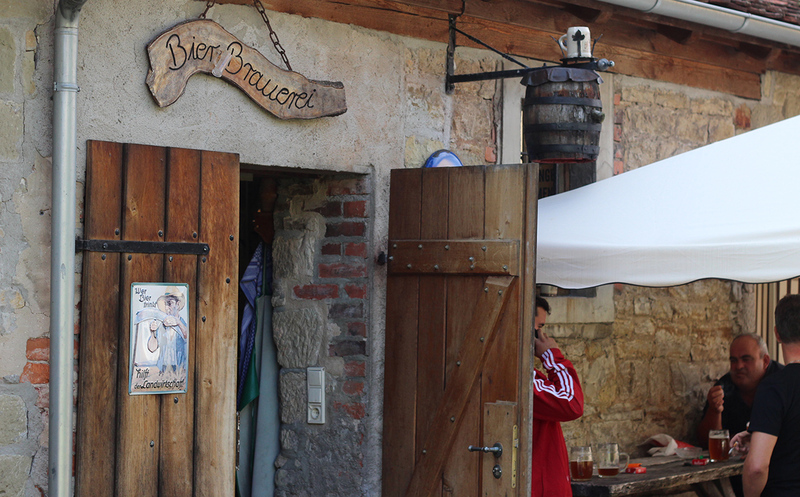 Seinsheimer Kellerbräu is now on our map, and a visit to Franconia will no longer feel complete without a hearty glass of this remarkable beer. 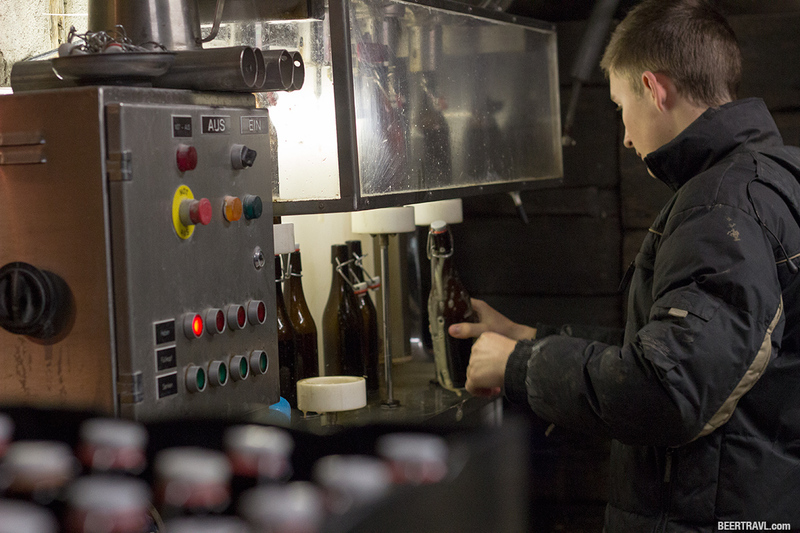 The brewers tap it directly from the maturation tank, and fill a small number of bottles sold at the brewery. From draft at Seinsheimer Kellerbrau in Seinsheim. Hazy chestnut brown body with rich red hues and a creamy tan colored head. Here we have an incredibly rich, malty dunkles kellerbier with an expressive core of toasted, just-burnt bread crustiness with accents of apple pastry, shaved almond and nougat. Juicy, sweet and succulent in the mouth, delivered by fine, low, natural carbonation... soft and velvety, with a seemingly infinite finish. Caramelized, rich, sweet and toasty with subtle underlying hop bitterness. Very rustic rendition that speaks Oberpfalzer Zoiglbier.